Read the Vauxhall Meriva MPV (2010 - 2012) car review by Auto Trader's motoring experts, covering price, specification, running costs, practicality, safety and how it drives. The Vauxhall Meriva is roomy inside, has a big boot, and there’s a range of different seating options and some innovative touches to further boost its versatility. These touches aren’t as effective as you’d hope, though, and the Meriva is also disappointing on the road and expensive to buy and run. 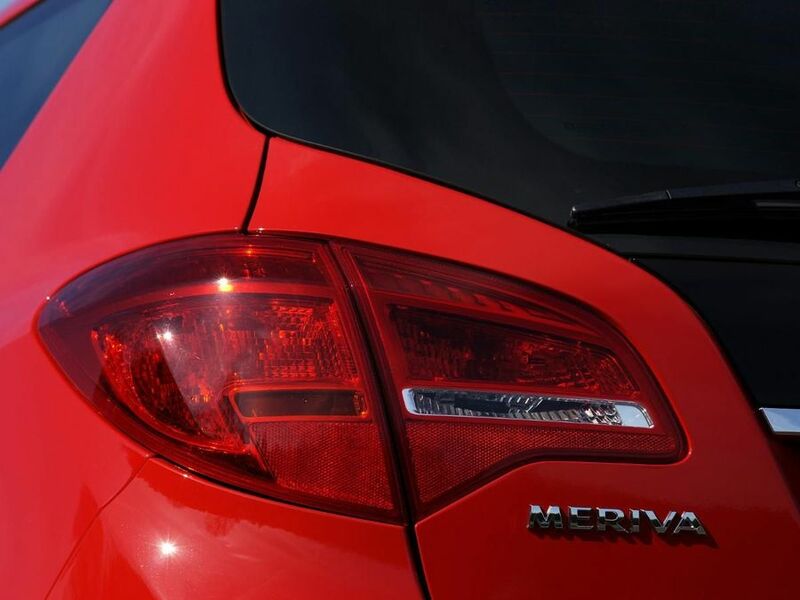 Interested in buying a Vauxhall Meriva? The Meriva isn’t exactly the most exciting car to look at, but the same can be said of most other small MPVs. There are some interesting features, like the kink halfway along the window line, but other than that, the styling is fairly conventional. All versions have body-coloured bumpers and mirror housings, but you have to progress halfway up the model range before smart alloy wheels come as standard. The Meriva’s driving position is a plus point. The driver’s seat has height adjustment and the steering wheel moves for both reach and rake, meaning you shouldn’t have any trouble getting comfortable. Visibility is pretty clear, too, but the same can’t be said of the dashboard layout: the centre console is smattered with too many buttons, making it difficult to find the one you want at a glance. Choose a car with sat-nav, and you’ll be even more confused by the illogical menus. The cabin feels very solidly put together and the materials in your eyeline have a pleasant textured finish. Some of the panels lower down, however, are a little harder and scratchier. The Meriva’s rear-hinged rear doors are designed to give easier access than conventional doors, but the aperture you climb in through is no bigger or less awkward. The car’s practicality much depends on which version you go for. All models have generous cabin space and rear seats that slide back and forth: Exclusiv and SE models, however, come with a rail-based storage system that intrudes into the footspace of the person in the middle-rear seat, making life uncomfortable. The boot is a decent size and it’s well shaped. Ride comfort is key in an MPV, and the Meriva’s isn’t as cosseting as many rivals. The firm suspension stops (just) short of being uncomfortable, but you and your family will be jittered around in your seat more than you’d like. This firmness does deliver decent body control in bends, plus there’s a decent amount of grip. The steering disappoints, though: it’s rather vague and remote, which doesn’t inspire much confidence on faster roads. Worse still, it’s too heavy around town, making parking more of a chore than it should be. Petrol buyers have the choice of three 1.4-litre engines – a naturally aspirated one producing 99bhp and two turbocharged ones, with 118bhp and 138bhp outputs. We’ve driven the two turbocharged versions, which are pretty smooth and flexible, if not quite a brisk as their power outputs suggest. The diesel engines will be more popular, though: there are two 1.3s, with 74bhp or 94bhp, and a 1.7 with 108bhp. All of these have decent punch, but deliver their power in one untidy lump in the middle of the rev range, and they cause too much noise and vibration. The 1.6 diesel, though, is much smoother and quieter, and delivers its 134bhp more consistently. The Meriva’s list prices look very steep when compared with those of most competitors, but bear in mind that your Vauxhall dealer will trim thousands off if you haggle. You’ll need to, because getting a large discount will help offset the relatively heavy depreciation losses caused by the car’s poor resale values. Fuel economy and CO2 emissions aren’t exactly stunning, either, due to the fact that most of the Meriva’s engine range is fairly ancient. Many rivals will prove cheaper to run. According to Warranty Direct’s Reliability Index, the Meriva does pretty well on this front, with an above-average score. In the manufacturer’s rankings, Vauxhall has achieved similar mid-table obscurity. If this so-so performance causes you any concern, you can be comforted by Vauxhall’s generous 100,000-mile warranty. The Meriva received a five-star Euro NCAP safety rating, scoring 89% for adult occupants. However encouraging that sounds, though, we’re concerned that low-end models don’t have enough airbags: Expression models only have driver and passenger ‘bags, while S trim add front-seat side airbags. Only Exclusive, Techline and SE trims have full-length curtain airbags. An electronic stability programme, anti-lock brakes, front seatbelt reminders (most models also come with a reminder system for the rear seats) and hill hold assist are standard across the range, though. The rear-hinged doors can only be opened while the car is stationary, thanks to an automatic lock that is activated as soon as the car pulls away. There are five trim levels: Expression, S, Exclusiv, Techline and SE. Entry-level models come fitted with an electric parking brake, electric front windows, remote locking and a CD player with MP3 compatibility. S adds a USB socket and an alarm, while Exclusiv adds air-conditioning, cruise control, steering wheel-mounted audio controls, ambient lighting and the FlexRail centre console system, with sliding trays and cup holders. Range-topping SE trim comes with a panoramic glass roof with electrically operated sunshade, alloy wheels, front fog lights, tinted glass, all-round electric windows and extra storage. Techline model are an oddity: these fleet-focused models come with a generous specification that lies somewhere between Exclusiv and SE, yet they’re among the cheapest models to buy. They’re good value, but bear in mind that these versions aren’t available with many of Vauxhall’s finance packages and you won’t get much of a discount. Vauxhall has attempted to give the Meriva a variety of flexible features to make it more versatile but, for the most part, it’s not really any more versatile than most of its rivals in the real world. It’s also disappointing to drive and it’s rather expensive to buy and run. Other mini-MPVs will gives you more capability for less money.